Founded in 1890, Emerson Electric (EMR) is a global industrial conglomerate that serves a variety of industries including oil and gas, refining, chemicals, power generation, pharma, food and beverages, pulp and paper, metal and mining, and municipal water supply. Emerson Electric brings together technology and engineering to provide solutions for customers in the process, industrial, commercial, and residential markets. Whether it’s monitoring food temperatures throughout the supply chain or replacing a deteriorating valve that could cause costly downtime, the company helps customers optimize their operations and increase reliability, efficiency, and safety. Emerson completed a number of strategic actions in recent years to streamline its portfolio and refocus on its core businesses. The company divested more than $5 billion worth of operations, including its network power systems and power generation, motors, and drives businesses. Meanwhile, in 2017 Emerson completed its $3.15 billion acquisition of Pentair's valves and controls business. This deal expanded Emerson's capabilities to help it provide broader solutions to more of its customers. Then, in October 2018, Emerson announced a deal to acquire General Electric's Intelligent Platforms division to strengthen its manufacturing automation business. While that company's $210 million in annual sales won't move the needle much for Emerson (just over a 1% revenue boost), management believes it's a great strategic fit that will enable the firm to offer even better machine control and cloud-connected solutions to the metals & mining, life sciences, food & beverage, and packaging industries. Automation Solutions (66% of sales, 58% of profits): enables manufacturers to maximize production, protect personnel and the environment, and optimize their energy efficiency and operating costs through a broad offering of integrated solutions and products, including measurement and analytical instrumentation, industrial valves and equipment, and process control systems. Commercial & Residential Solutions (34% of sales, 42% of profits): provides products and solutions that promote energy efficiency, enhance household and commercial comfort, and protect food quality and sustainability through heating, air conditioning, and refrigeration technology, as well as a broad range of tools and appliance solutions. Geographically, the company generates 49% of its revenue in North America, 23% in Asia, 17% in Europe, 6% in Middle East/Africa, and 5% in Latin America. Emerson Electric is a dividend king that has raised its payout for 62 consecutive years. Very few companies have been in business as long as Emerson Electric has, and even fewer can boast such a lengthy dividend growth streak. The company’s track record speaks to its durability, disciplined capital allocation, and numerous competitive advantages. Emerson sells thousands of different products, but almost all of them account for just a small percentage of an end product’s total cost (3% to 4% according to management). As a result, customers have fewer reasons to squeeze Emerson on prices or consider switching to competitors' offerings. That's especially true since most of Emerson’s products also provide mission-critical functionality, such as gauging the pressure and flow rate of an oil well. The company’s customers need reliability, so Emerson’s longevity and proven expertise give it a trusted reputation and strong market share position. And with many manufacturing control systems lasting for a couple of decades, Emerson's risk of losing market share is especially low. Unlike many other industrial companies, Emerson sells many of its products through a large direct sales force and also has thousands of field engineers working directly with its customers. These efforts further solidify its favorable brand perception and customer relationships, deepening switching costs and helping the company continuously deliver innovative, rigorous solutions that solve customers’ most challenging problems. Thanks to the company’s selectiveness with which product niches it enters, as well as its focus on quality, reliability, and strong customer relationships, Emerson has maintained a leading market share position in many core categories – control valves, fluid control, measurement devices, compressors, and more. Holding onto top market share positions for 100+ years has many benefits, including a massive installed base in the tens of billions of dollars. Having a sizable installed base helps smooth out results because it provides more reliable (and high-margin) aftermarket business – customers need to keep their equipment up and running to stay efficient, and Emerson helps them do that. In fact, predictive maintenance can lead to a 30% reduction in maintenance costs and a 70% cut in downtime from equipment breakdowns, according to the company. Not surprisingly, a lot of Emerson’s industrial automation products (wireless sensors, software, instrumentation, etc.) are tied to the “industrial internet” theme. The internet of things (IoT), which Emerson has helped to pioneer in many of its industries, could be a solid long-term growth opportunity for the business. Zion Market Research pegged the industrial internet of things market at $145 billion in 2017 and expects it to grow 8% annually to hit $232 billion by 2023, for example. One of the more valuable IoT applications is monitoring equipment to identify when it needs maintenance before it experiences a problem. Emerson is an industry leader in providing such data monitoring solutions that can improve reliability and thus minimize costly accidents, shutdowns, and ultimately make its customers more money over the long term. Better yet, Emerson's software offerings provide a source of recurring revenue as well. Most industrial plant managers lack the data analysis skills needed to interpret the large amount of information their internet-connected machines are sending them, providing Emerson with opportunities to help. Emerson is essentially a one-stop shop, offering its clients machine control hardware, a data analytics platform (IoT), and the analysis solutions needed to put it all together to maximize productivity and profits. As IoT technology continues advancing and data management needs grow, Emerson has the potential to increasingly monetize its large installed base. For example, the company has installed more than 30,000 wireless networks that have logged well over 10 billion operating hours and help monitor 10 million devices worldwide. There are plenty of insights to be harvested there to help customers continue becoming more efficient. Besides providing products and services that seem likely to continue growing in demand over the years ahead, another advantage the company has is a strong corporate culture with low turnover. CEO David Farr has been with the company for over 30 years and served as CEO for 18 years. Farr is Emerson's third CEO in 63 years, indicating that the company's top executives have a lot of experience in successfully adapting to changes in the industry. Since taking the top spot in 2000, Farr has done an admirable job of selling off low-margin businesses, acquiring more profitable divisions, and expanding into developing markets, which will be a key for sustaining long-term growth. In 2018 the company spent a total of $2.2 billion on bolt-on acquisitions to enhance its two business segments. In addition to buying GE's Intelligent Platforms unit, in May 2018 Emerson announced it was spending $600 million to buy European firm Aventics, a leader in smart pneumatic technologies used in the food and beverage, packaging, automotive assembly, and medical equipment industries. Smart pneumatics is a $13 billion global market, and the Aventics purchase is a classic example of how Emerson grows both from its own R&D efforts, as well as acquiring industry leaders in large but highly fragmented industrial component and automation industries. Management says it plans to continue accelerating bolt-on purchases through at least 2021. Emerson's two business segments have benefited greatly from such bolt-on acquisitions over the years, and there appears to be plenty of growth runway left. In fact, the company estimates that the addressable global industrial automation market is more than $200 billion, but Emerson's market share is well under 10%. Commercial and residential markets add another $30 billion to the company's addressable market. Emerson is among the leading innovators when it comes to energy efficient heating and cooling systems, which helps explain this segment’s impressive operating margins (over 22% in 2018). Despite Emerson's long-term expansion opportunities, industrial companies are still cyclical, with growth in sales, earnings, and cash flow generally tied to that of the broader global economy. With decades of experience in both good business cycles and bad, the company has managed to use disciplined cost-cutting to keep Emerson’s margins and returns on capital far above its peers. 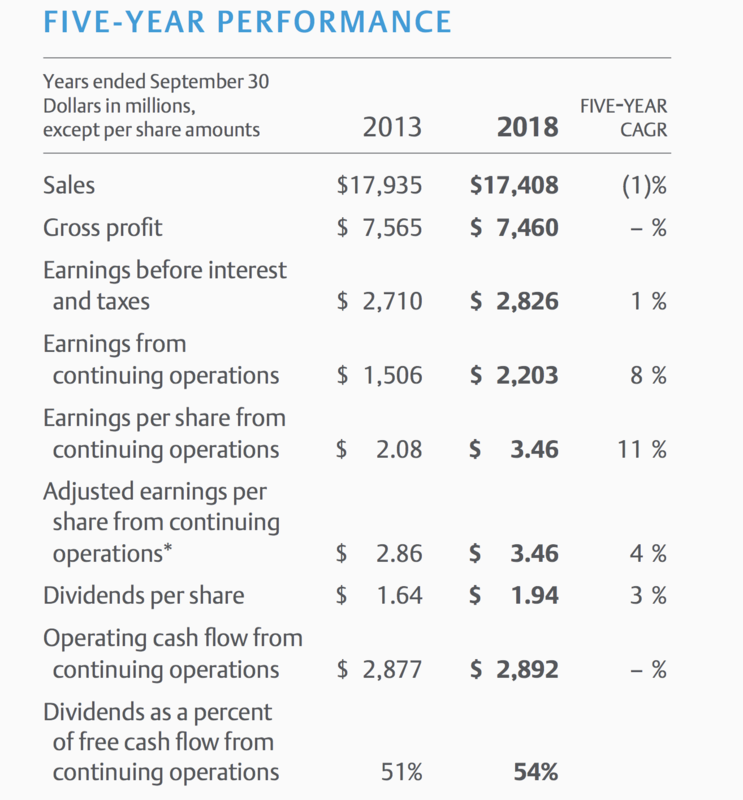 Perhaps most importantly, Emerson has maintained a high free cash flow margin (10+% even during the financial crisis) that has continued to support its dividend and allowed continued dividend growth, even though numerous lean periods. While acquisitions are a key component of Emerson's long-term growth strategy, management takes a conservative approach when it comes to financing these deals. The company is run with very conservative leverage, earning Emerson an A credit rating. Management feels comfortable taking on more debt in the future thanks in part to tax reform, but the firm's financial flexibility should remain strong to keep the dividend safe and growing. Overall, Emerson Electric is one of the most proven industrial companies in the market, with a disciplined corporate culture that has proven it can both grow the business and the dividend, in virtually any economic, industry or interest rate environment. There are several risks to be aware of before investing in Emerson. First, Emerson's multi-year strategic reshuffling of its assets has resulted in flat growth in operating cash flow and slow dividend growth over the last five years. Such restructurings are periodically necessary for sprawling businesses like Emerson, so investors need to expect they will occur from time to time, resulting in lumpy growth rates. Fortunately, the company appears largely done with its most recent restructuring and poised to return to much stronger growth in the coming years, which will hopefully result in faster dividend growth as well. However, it's important to remember that due to the cyclical nature of the industries in which Emerson operates, management's optimistic growth guidance through 2021 might not materialize. For example, even after the company's restructuring in recent years, Emerson is still heavily exposed to the oil & gas sector. In fact, nearly half of its revenue comes from this highly cyclical industry which accounts for about 30% of its automation solutions installed base. Investors considering Emerson should think of it almost more as energy or basic materials company given its customers' dependence on economic growth and high commodity prices. Its aftermarket business makes it less volatile, but Emerson is still sensitive to macro conditions. In addition, Emerson's geographic diversification, which is likely to increase in the coming years, exposes the company to some foreign currency exchange rate risk. When the U.S. dollar strengthens, the company reports lower sales and earnings for accounting purposes. Fortunately, Emerson’s sales and manufacturing costs are fairly well aligned regionally, minimizing the risk to its actual profits. However, the company’s foreign competitors are better able to undercut the company on price when the U.S. dollar is strong. This shouldn’t impact Emerson’s long-term earnings power, but it could weigh on the stock any given quarter or year. In fiscal 2019, for example, management expects the strong dollar to hurt the firm's reported sales and cash flow growth rates by 200 basis points, which is significant for a relatively slow-growing company like this. Finally, Emerson has made it clear that the company is on the hunt for acquisitions, driven in part by a desire to replace some of the lower-margin, slower-growing revenue it divested in recent years. While bolt-on deals are often a good move for industrial companies, Emerson is also interested in deals that are significantly larger in size. The company bid nearly $30 billion for Rockwell Automation (ROK) in late 2017, for example, but its offer was rejected. Large acquisitions increase risk, as management teams are often prone to overestimating synergies, underestimating integration costs, and paying too much for a prized asset. Emerson's management team deserves the benefit of the doubt here given their capital allocation track record, but there are never any guarantees. Emerson Electric is a tried-and-true dividend grower with enduring competitive advantages stemming from its global scale, large installed base, wide breadth of mission-critical solutions, and conservative management team. The company's recent moves to reposition its business for stronger long-term growth and better profitability should bear fruit going forward, even if they have come at the expense of earnings and dividend growth over the last five years. As industrial companies seek to become more efficient and manufacturers embrace more digital technologies, the company should also enjoy some wind at its back thanks to its large presence in automation markets. Income investors shouldn't forget about Emerson Electric's sensitivity to commodity prices and the general health of the industrial economy. However, the company appears to have the financial strength and discipline to ride out just about any cycle thrown its way while improving its long-term earnings power. With its corporate restructuring now largely complete, it appears that Emerson investors are set to enjoy stronger sales, earnings, and dividend growth in the coming years, further raising the appeal of this dividend king.